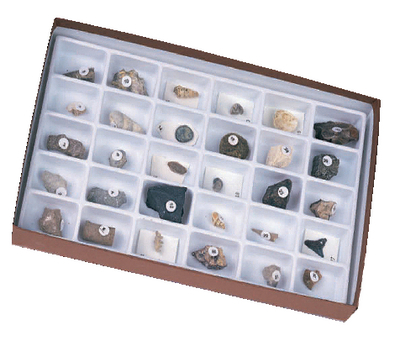 These collections provide background into the history of life on Earth. Each set contains individually numbered specimens housed in a compartmented collection box with removable tray and key list. The average sample size is 1/2 to 1". This compact set of 30 carefully selected fossils provides an excellent background to key plant and animal life forms spanning nearly 600 million years. From trilobites to corals, students learn to recognize important taxonomic features from many major groups.